After a group of theorists from MIT has demonstrated that phonons and photons could be simultaneously localized within the same cavity created in a silicon nanostructure, raised the question of their mutual interaction. 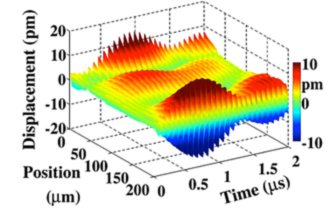 In this context, the team « Phononic Crystals » at INSP, in collaboration with theorists at IEMN in Lille, has studied the dynamics of confinement of an elastic wave, in a vacancy-type defect introduced within a two dimensional phononic crystal. They have measured the displacements field associated with the cavity modes, using in situ time-resolved experiments. They have shown that the elastic energy first gets localized in the part of the defect the furthest away from the acoustic source, and that the dynamics of localization depends on the symmetry of the eigenmode. When a point defect is introduced in an otherwise perfect phononic crystal, the properties of the band gaps are modified. This results in the appearance of one or several modes of vibration localized within the defect. Generally, the frequency and the polarization of these modes are determined using numerical techniques including the plane wave expansion of the equations of motion or finite element methods. Both these numerical methods can predict the location of the nodes and antinodes of any stationary modes trapped in the defect, what their frequencies and their phase are… However they are not relevant to provide information neither on the transient regime which precedes the stationary state, nor on how these localized modes can be excited. The two dimensional phononic crystal that we have studied, is made of a honeycomb lattice of air holes drilled in a silicon membrane. 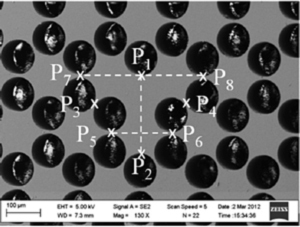 Both the thickness of the membrane and the diameter of the air inclusions were about 100 microns (Fig. 1). If one air hole is omitted, a two dimensional cavity is formed where only two defect modes with a significant out-of-plane component may be confined (Fig. 2). These two modes have very different symmetries but their frequencies are very close each other : 15.3 and 15.4 MHz. The experiment consists in exciting the phononic plate into vibration with a pulsed laser, upon a flexural anti-symmetric mode (called A0 Lamb wave) at the frequency of a defect modes and to monitor the resulting out-of-plane displacements at any point inside the cavity, with a Michelson interferometer. Displacements as small as a few picometers can be measured with this technique. This technique allows to selectively excite a cavity mode by properly choosing the location of the elastic source. Amplitude of out-of-plane component for two localized modes in the cavity represented in figure 1. Out-of-plane component of displacement measured along the line between P1 (0 at the position axis) and P2 ( 200 μm). The frequency of the acoustic wave is centered at 15 MHz. An example of the displacements field associated to the mode vibrating at 15.4 MHz, as a function of both time and position is displayed in figure 3. This figure shows that an antinode of vibration is formed first at the point of the defect the furthest away from the acoustic source (P2 in figure 1), about 200 ns before another antinode appears at the input of the cavity at P1. This delay is related to the time needed by the ultrasonic pulse to make a round-trip in the defect and to interfere with itself to form a standing wave in the cavity. All these results are scalable to a two dimensional phononic crystal on a silicon membrane with lateral dimensions of about several hundred nanometers. 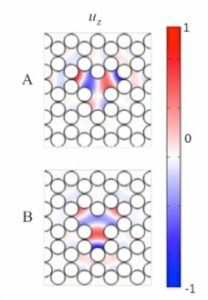 Under certain conditions of symmetry, an elastic mode and an optical mode at a wavelength suitable for telecommunications (λ=1.5 μm) can be simultaneously confined and interact in such a heterostructure. This new class of heterostructure is called a phoXonic crystal.